I don't know a whole lot about this pattern other that what John Nielsen reported in the February 2009 issue of the Heart of America Carnival Glass Bulletin. He points out that the pattern was found in a book about Cambridge Glass listing 35 shapes in crystal. It was identified as "Nearcut" Design 2635 Fernland. In a 1940 book, Minnie Watson Kamm named the pattern "Snowflake" for the design found near the top and that name seems to have stuck. 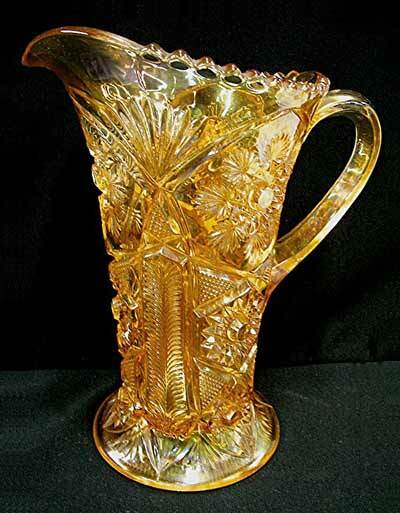 This marigold pitcher sold at a Jim Wroda auction in 2007 for $400. Another sale was in 2013 for $650. Whether it was this same pitcher or another of the few that exist I don't know.